As a teenager, I was fascinated with editing video, but the only tools available were expensive, clunky, and based on tape cassettes (VHS etc). In my last year at high school, my arts and media focus switched to music, which could be made using simpler technology, which was much more readily available. Since then, other than keeping a jealous eye on the evolution of video tools - especially in relation to their use in independent media, and the availability of free code tools for video - my interest in video editing has simmered away on the backburner. I have made the odd attempt to edit video with free code tools on GNU+Linux. I tried Pitivi when it was included in the default Ubuntu install (before I switched to Trisquel), but I had the same issues Chris Long reports in his 2015 blog post ‘The current state of video editing for Linux‘, constant crashes. 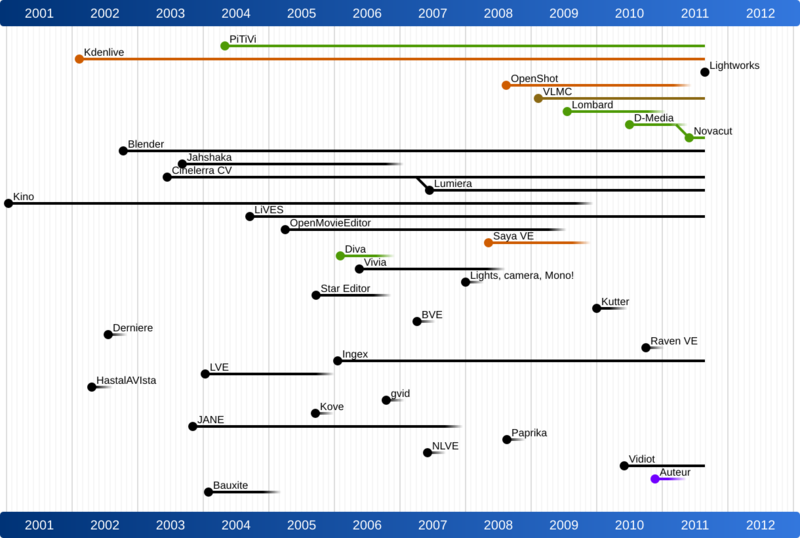 One of the reasons why stable, user-friendly video editing on GNU+Linux is best summed up by a graphic on the Pitivi site visualising the development history of all the free code video editing projects which have existed since 1998. Basically, video editing is a complex thing to program, but instead of pooling their efforts on one or two (or three) major projects, developers have been starting and abandoning projects all over the place, leaving users scratching our heads trying to figure out what project will reach a stable milestone, and when. One of the major sticking points with my video editing attempts was that when something wasn’t working, it was hard to tell if the problem was my lack of general familiarity with non-linear-video-editing software, bugs in the software itself, or compatibility problems with the particular GNU/Linux distro I was running, or the laptop I was running it on. So today, I decided to investigate what free code software for video-editing I might be able to use on my fiancee’s MacBook Pro (MacOS 10.6.8), as a stepping stone to editing video on an entirely free code stack.